Risotto is a delicious, luxurious meal, but it demands a bit too much hands-on effort for a weeknight supper. 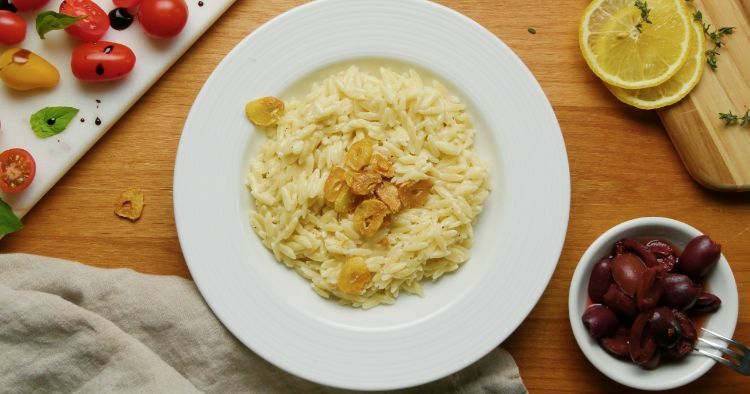 This orzo dish has all of risotto's creaminess with a fraction of the work! A combination of Parmesan, mascarpone, and a nice dose of garlic makes this dish truly special. Garlic can be a bit bitter when raw or overcooked, so be careful to make sure you cook yours just enough. It will continue to cook from the residual heat, so remove it from the oil before you think it's ready for crisp, sweet garlic with a rich yet mellow flavor. Meanwhile, heat the olive oil in a large nonstick pan over medium-high heat. When the oil is hot (test by adding a single drop of water and if it sizzles, you're good!) scatter the garlic slices into the oil, making sure they are not stuck together or overlapping. Fry for about 1-2 minutes: the moment they begin to get slightly blond, carefully pour them into a colander set over an oven-safe bowl. 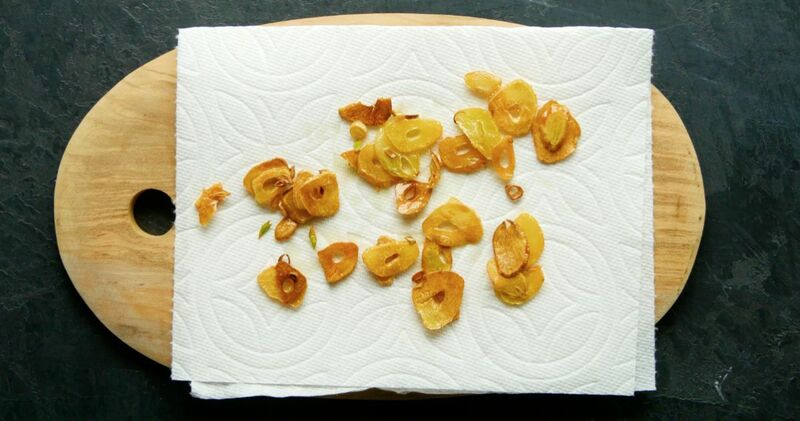 Scatter the garlic slices over paper towels in an even layer, and sprinkle immediately with the fleur de sel. Set aside. When the orzo is cooked, drain it in a colander, reserving about a cup of the cooking liquid. Return the orzo to its pot and add the mascarpone and Parmesan. Add 1 tablespoon of the reserved garlic oil and as much of the reserved pasta water you need to thin the sauce out to your liking. Stir well to combine. Season with the pepper and nutmeg and serve in individual bowls topped with a few garlic chips.